This week, Michelle continues her look at some final releases from Del Rey Manga, while I check out some new manga from Yen Press and Tokyopop. MELINDA: HAHAHAHAHAHAHAHAHAHAHAHAHAHAHAHAHAHA. Okay. *whew* Gotta recover here. MICHELLE: Maybe we can recover by discussing some manga. By the way, you’re looking radiant tonight. MELINDA: Why, thank you! You’re exceptionally brilliant, and possibly a little sparkly. MELINDA: I suspected as much! Well, now that we both feel properly affirmed, I suppose we could talk about some manga. MICHELLE: It is what we’re here for, after all! MELINDA: Yes, yes, it is. So, usually I would save my favorite selection for last, but I admit that tonight I’m so anxious to talk about one of the manga I just read, that I’m going to just give in and go for it. I don’t know if you’ve read it yet, but I suspect you’re looking forward to it. Promise not to shriek when I tell you what it is? MICHELLE: I will try to contain myself. MELINDA: Good luck! 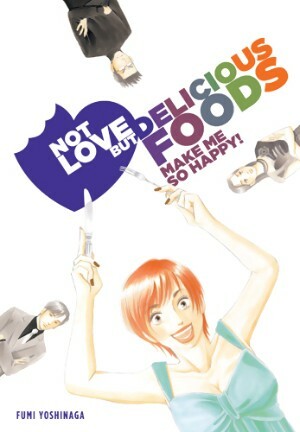 As you may have guessed by this point, it’s Fumi Yoshinaga’s Not Love But Delicious Foods (Make Me So Happy), due out in December from Yen Press. As a fan of Yoshinaga’s previously-translated works, I’ve been eagerly anticipating this release for some time, though I knew very little about it, specifically, before I pulled open the cover. What I discovered inside was even more charming than I’d imagined. The book is essentially a tour of several of the author’s favorite Tokyo restaurants, highlighting each establishment’s specialties, and including details ranging all the way from atmosphere to parking recommendations. What makes it especially rewarding for Yoshinaga fans, however, is that Yoshinaga herself stars as the main character, surrounded by her circle of friends. How much of this is fictionalized, of course we can’t know, but it feels so authentic, the overwhelming sense for readers is that we’re getting a peek into Yoshinaga’s private world, with a delightful view of her real-life quirks, hopes, desires, and of course, her obsessive love of food. Yoshinaga portrays herself as an aging, neurotic slacker who eats like a horse, routinely spills food on her clothing, and has a thing for cute, chubby men, all of which makes her even more appealing to an older female reader like me. She strikes exactly the right balance between self-deprecation and self-love, warding off any danger of approaching either desperation or narcissism. She’s neurotic, sure, but also keenly self-aware, and her affection for her friends (be they real or fictional) is palpable. There isn’t a real story to this manga, just a series of episodes moving from restaurant to restaurant, but what makes each chapter come together is a strong feeling of intimacy with the characters and the author’s characteristic banter. Humorous dialogue is Yoshinaga’s specialty, and she uses it to great advantage in this book, stringing together descriptions of complicated dishes in the most natural way possible. And then there’s the food. Oh, the food, Michelle. It took about five pages of this book to get my mouth watering, and it didn’t stop until the end. Even things like “liver sashimi” and “stewed beef tendon” manage to sound appetizing in this context. I should note too, translator William Flanagan mentioned recently on Twitter how much of a challenge all the foodie talk was for him, but it doesn’t show in the slightest. The food looks and sounds absolutely delicious. Honestly, I’m getting hungry just remembering it all. MICHELLE: This really sounds wonderful. There are some storytellers so gifted that one would happily read anything they decided to write about, even if it were merely the contents of their sock drawer or something, and Yoshinaga is definitely among their number. I’m also very happy we’ve been getting some foodie manga lately and hope the trend continues! MELINDA: Yes, it’s hard to imagine Yoshinaga’s writing as anything but but completely charming. There are few writers in any medium whose work I enjoy so consistently. Before I start getting sentimental, what have you got for us this evening? MICHELLE: Well, once again I am marking the sorrowful passing of Del Rey by spotlighting two of their recent releases, both of which are (assuming the omnibus trend for one continues) the penultimate volume of their series. Rather than repeat myself later, let me go ahead and make a plea to Kodansha to finish both of them one of these days! 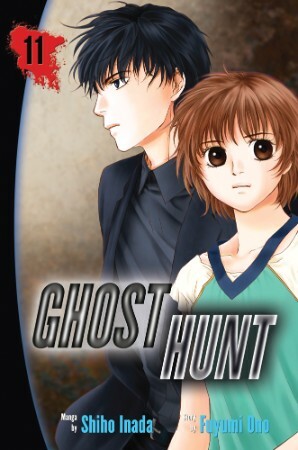 First up is the eleventh volume of Ghost Hunt, based on a series of novels by Fuyumi Ono and adapted into a manga by Shiho Inada. The premise of the series is that a young man named Kazuya Shibuya (dubbed “Naru” for his narcissistic tendencies) has founded a psychic research agency that takes on various assignments and attempts to scientifically measure paranormal activity while also employing more traditional methods of spiritual communication and exorcism. In the tenth volume they were approached by a village mayor to look into an abandoned school, and in the course of their investigation, two members of their group disappeared. It’s been over a year since that volume was released in English, and while I enjoyed the cliffhanger at the time, much of the thrill has now worn off. I believe these volumes come out once a year in Japan—the series is no longer serialized in a magazine—and it seems that Inada has lost the narrative thread to some extent in that interval. Oh sure, the way several spirit children are able to insinuate themselves into the group is pretty creepy, and I am always a sucker for a spooky building, but for large sections of the volume, people are just sitting around, swaddled in murky screentone. It’s disappointing. On the bright side, one of the abiding mysteries of the series is the nature of Naru’s tremendous psychic power, compounded recently with some clues about his missing brother. The final page of the book suggests this storyline will be featured prominently in the next (and last) volume, so although this is not the best installment of Ghost Hunt, I am by no means ready to give up on the series entirely. MELINDA: It would be nice to think that a series that has been strong in the past can muster up some momentum at least for its final volume, eh? Though you would think that mustering might have begun already. MICHELLE: Ghost Hunt has actually had some problems with inconsistency before, particularly where character design is concerned. I’ve come to expect that from the series, honestly. The first five volumes are the best, in my opinion, and I suspect this has something to do with the fact that they correspond to the period when chapters were serialized in a magazine and therefore possibly subjected to more thorough editorial oversight. MELINDA: That makes a lot of sense. MICHELLE: Thanks! What else have you read this week? MELINDA: Well, speaking of disappointment, I’d heard some positive buzz about Summoner Girl, a new manga from TOKYOPOP, but though it certainly has its strong points, I didn’t enjoy it quite as much as I’d expected. Hibiki is a fourth grader who is chosen by birthright to battle malevolent spirits called “ayakashi.” Accompanied by five powerful shikigami (who appear to the world as adorable, bird-like creatures), she is able to fight the ayakashi by summoning the shikigami to possess her body, thereby taking on their powers. In addition, she’s tasked by her grandmother with hunting down six magical jewels which would render her leader of her people, the Exorcists. Now, I’ll be the first to admit that “magical girl” is not my favorite manga genre, though I certainly have favorites that fall into that category. 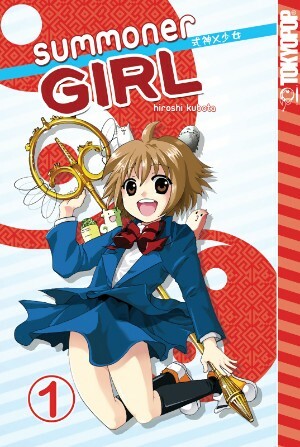 But while Summoner Girl possesses many of the genre’s better qualities–supernatural fantasy, a powerful (young) female heroine, and a lot of kinetic energy, it lacks the kind of emotional resonance found in something like Shugo Chara!, whose heroine not only achieves feats of daring do, but also struggles with a pretty serious identity crisis, the likes of which even a 40-something manga blogger might relate to. You know, theoretically. While it’s not quite fair to place 40-something expectations on a manga series written for kids or even teens, the bar has been set unfortunately high. Even CardCaptor Sakura, which more closely resembles this manga in content and tone, is quirkier and more emotionally complex. On the other hand, Summoner Girl does offer up some cute, energetic artwork, and a spunky lead, who may yet be more complicated than she appears. As it is, I’d recommend it mainly for younger readers, which would appear to be closer to its target audience. MICHELLE: Yeah, I was unsure about this one. The whole thing about the “magical jewels” gave me pause, though it is only three volumes long, which is surely a point in its favor! MELINDA: Maybe, maybe not. My question would be at that point, is there really time for it to become anything more than it is? MELINDA: Well, it’s cute enough to give it three volumes to show its stuff, I guess. So what else do you have from Del Rey this week? MICHELLE: The omnibus collecting volumes five and six of Papillon by Miwa Ueda! As with Ghost Hunt, my experience reading these volumes was quite different than my last brush with the series, but in this case my reaction somehow morphed from annoyance to actual enjoyment! What I had to grasp, you see, is that the secret to having fun with Papillon is not liking anyone! The series revolves around two twin sisters, Ageha and Hana Mizuki, who were raised separately for reasons I can’t recall. Hana is beautiful and confident has no trouble attracting attention, and slouchy Ageha has always felt in her shadow until she gets a makeover, followed by a boyfriend in the form of a way-too-old-for-her guidance counselor named Hayato Ichijiku. While Ageha approaches everything in an earnest way, Hana is much more guarded and sneaky, and impersonates Ageha several times, mostly as a test to see whether her current boyfriend is able to resist her sister’s charms. As the series has progressed it’s become more apparent that Ageha is actually not the one with the serious sister complex. Hana is really the one with some real baggage to work through, and though I’m probably supposed to find her the villain of the piece, she is by far the most fascinating and compelling character. Because I don’t care one bit about Ageha and Ichijiku as a couple, when a disguised Hana is able to steal a kiss from Ichijiku, it’s actually kind of awesome. I mean, how often have you read a series where someone disguises herself as the heroine in order to make out with her boyfriend? Not many, right? The crazy plots don’t stop there, either. Shortly after impersonating her sister, Hana is hit by a car and ends up at a hospital, where someone from Ichijiku’s past claims that he’s a murderer, information Hana promptly uses to attempt to blackmail him into dumping her sister and dating her instead. It’s a complete and utter soap opera, but of the best kind. I suspect that this is what Ueda’s most famous series, Peach Girl, is like to read, which makes me all the more eager to check it out. MICHELLE: I know! I am usually all about the likable characters. Really, though, for all her scheming Hana is loads more sympathetic than Ageha is. Or at least she’s more unique. Girls like Ageha are a dime a dozen in manga, but rarely does a story feature someone who would seem to have it all but has a hard time expressing her unhappiness. MICHELLE: Okay, probably I do. But I wouldn’t trust her! MELINDA: The real question of course, Michelle, is would you shriek at her? Thanks to Michelle for indulging me as always! Join us again next week for an all new Off the Shelf! Not Love But Delicious Foods: Want. It’s totally unfair that you guys are all gushing about this book that we plebes can’t get yet. Weirdly, I live in an area with a lot of great & varied restaurants, but as far as I’m aware, I can’t get pho. I’ve been dying to try it, since I have friends who eat it constantly & are always describing it in delicious terms. I’ll have to make a trip to Boston & get myself some beef tendon. I’m right with you on raw liver, though Yoshinaga makes it sound scrumptious. I tried pho once but it was lackluster. I need to have it from a proper Vietnamese place.